Being a member of Rock Star Rewards has its privileges. Now you can view your comp earning directly at a slot machine or kiosk! Comps can now be redeemed directly at any of our Food and Beverage outlet, plus you may be eligible to receive member only invitations to special events, tournaments and many more exclusive offers. A three-tiered players card program. Your current tier level will be mirrored upon transition. Enables new quick and easy access to Free Play right at your favorite game. New promotions right on the slot machine when you play with your card. Features Comp Dollars. Earn them as you play...spend them as you may. Aligns with PlaySmart, OLG’s industry leading Responsible Gaming program. 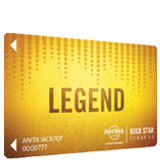 Rock Star is the first stage and you'll begin earning rewards the moment you begin playing! 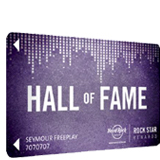 Earn 15,000 Status Tier points to be upgraded to Hall of Fame Status. Earn rewards dollars 50% faster! Earn 100,000 Status Tier points to be upgraded to Legend Status. 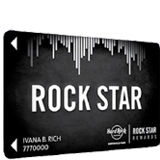 Rock Star Rewards card tiers are achieved in a 6-month period. Once you have earned the required Tier points you are immediately elevated to the next tier status. Complimentary valet service is provided to guests who require wheelchairs or have mobility issues. Must be 19 years of age or older. Valid government-issued photo identification may be required. There is no fee payable to obtain membership. Patrons with self-excluded or trespassed statues, as determined by OLG, will not be eligible to participate. Any self-excluded person detected at a gaming property will be removed and trespassed. Rules and Regulations apply. Please visit Player's Club for further details. Additional terms and conditions may apply.